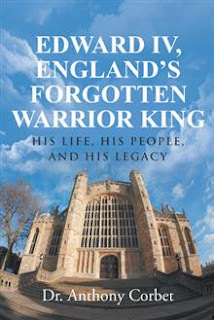 Dog Eared Publicity is pleased to bring you Dr. Anthony Corbet's EDWARD IV, ENGLAND'S FORGOTTEN WARRIOR KING Book Tour! As the 100 Years War ground to its dismal end, England groaned under the misrule of Henry VI and his Lancastrian favorites. The House of York rose in rebellion; and Parliament restored York in the line of inheritance to the throne. Edward, Earl of March, triumphed at the Battle of Mortimer’s Cross; Parliament asked him to be King and the people proclaimed him Edward IV. His life and legacy are chronicled in Edward IV, England’s Forgotten Warrior King. For ten years, Edward struggled against repeated Lancastrian rebellions. He was driven from his kingdom by Richard, Earl of Warwick, but then he won decisive victories at the Battles of Barnet and Tewkesbury in 1471. For another twelve years, he reigned wisely with peace and prosperity, as a beloved King; but then he died at age forty one and his twelve-year-old son was proclaimed Edward V. Richard, Duke of Gloucester, seized the throne and put young Edward and his brother in the Tower of London, from where they never emerged alive. Richard III was a good King and wanted to be respected, but the people believed he had murdered the Princes in the Tower, and would not forgive him. Queen Elizabeth and Margaret Beaufort plotted with Henry Tudor, who invaded England in 1485. Henry Tudor then defeated and killed Richard III at the Battle of Bosworth Field. Henry Tudor (Henry VII) was crowned King and married Edward IV’s daughter Elizabeth; the resultant Tudor dynasty would rule England for another 118 years. Dr. Anthony Corbet was born in Perth, Australia. He graduated from the Adelaide Medical School in 1963; he trained in Pediatrics and Neonatology at Sydney and Montreal. He held professorial/research positions at Baylor College of Medicine in Houston. Since 1994, Dr. Corbet has practiced at the Children’s Hospital in San Antonio.